As part of PMI-Montréal’s 40th Anniversary Guided Tour series, forty professionals gathered in the lobby of Maison Radio-Canada on René-Lévesque Street East. Among us, architects electrical engineers, mechanical engineers and project managers like myself, sharing an interest in understanding the complexities behind the scenes of running a multimedia giant such as Radio-Canada, which houses studios for radio, television and online content. During a 3-hour tour, we met with Denis Poitras, Operations Management and Security, and Lyne Dubois, Project Manager, who shared with us the project plans for the future of Radio-Canada. Decimal clocks (featuring hour-minute-second) representing time zones across the country are plastered in every studio; often times a digital timer on the desk along with an analog clock on the wall. Attention to timing is of the utmost importance for radio and television, while attention to detail makes it all possible. The building is equipped with soundproofing and anti-vibration systems, moving panels to accommodate variable acoustics, highly specialized equipment, and even windows designed with a curvature to contribute to excellent sound quality for listeners and viewers at home. 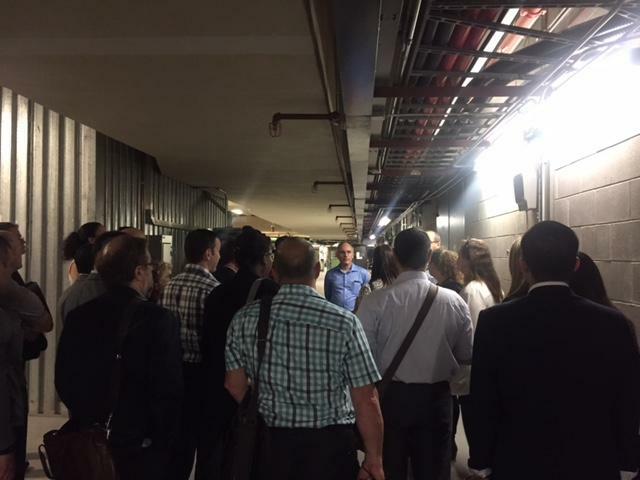 Our tour included a visit to the 3-level basement that encompasses a complex structure of 30 ventilation systems, 4 water towers, 17 electric systems and 4 generators, among other things, to keep the public broadcaster running. This same complexity and consideration will play a major factor in the development project for the new head office, set to be opened in 2020. 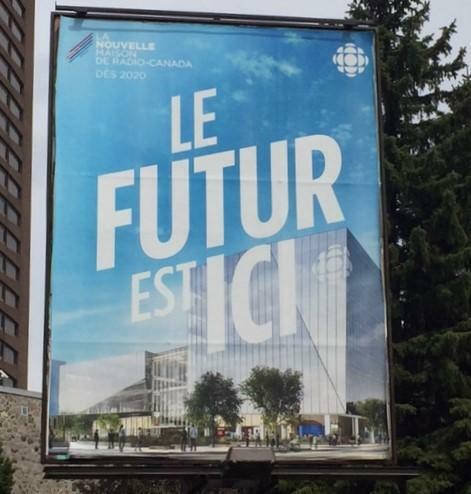 Radio-Canada has partnered with Broccolini Construction (via a call for tender, which was approved by the Board of directors), to build a brand new Maison, which will be managed as a project as opposed to a program, given the interrelated connectedness of the technology, construction and change management that is required for success. Dubois is taking a phased approach in this project, as it will be business as usual without interruption throughout the construction of the new building, which will only be about two-thirds the size of the current building. With the advent of digital content, there will be less permanent production spaces to give way for more multifunctional spaces. This concept of universality will also be utilized for the 2,500-employee workspaces, as the new building will be open concept with unassigned desks to facilitate collaboration. 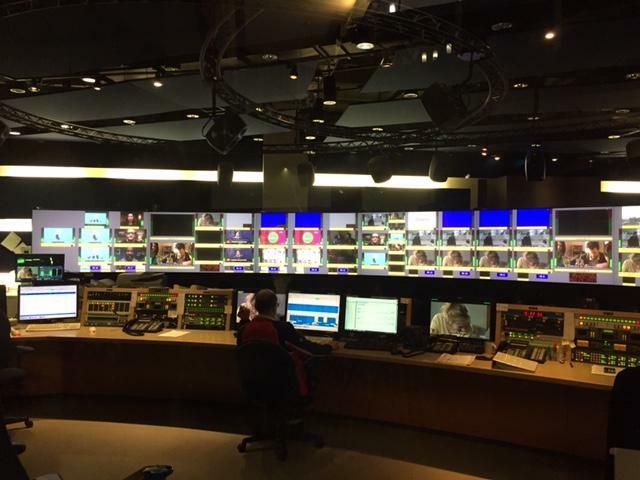 This is a trend in office design but it does not come without its own challenges, which is why Dubois is adopting change management practices to prepare the Radio-Canada family throughout this transition. Another notable change is in technology. The project coincides with the end-of-life of many of the specialized equipment used at Radio-Canada, therefore employees will require training in order to operate the new fleet that will await them in their new Maison; a “home” that is being designed to accommodate accessibility, green space, multifunctional usage, the best in design, the newest technology and even childcare, to meets the needs of their employees and of the ever-changing and demanding needs of their clients, Canadians! 40 years, celebrated from up high!